McCain punched first, accusing his colleague of being a foreign agent for an adversary at a time when that actually doesn’t seem insane, but Rand Paul came right back at him with a personal attack. “Well, I think he makes a really, really strong case for term limits,” he responded Thursday on Morning Joe. “I think he’s past his prime, maybe he’s gotten a little bit unhinged.” Fight! This animosity probably all began with the infamous “wacko birds” comment, which is how McCain described right-wing colleagues including Paul who were trying to block the confirmation of CIA director John Brennan over U.S. drone policy. 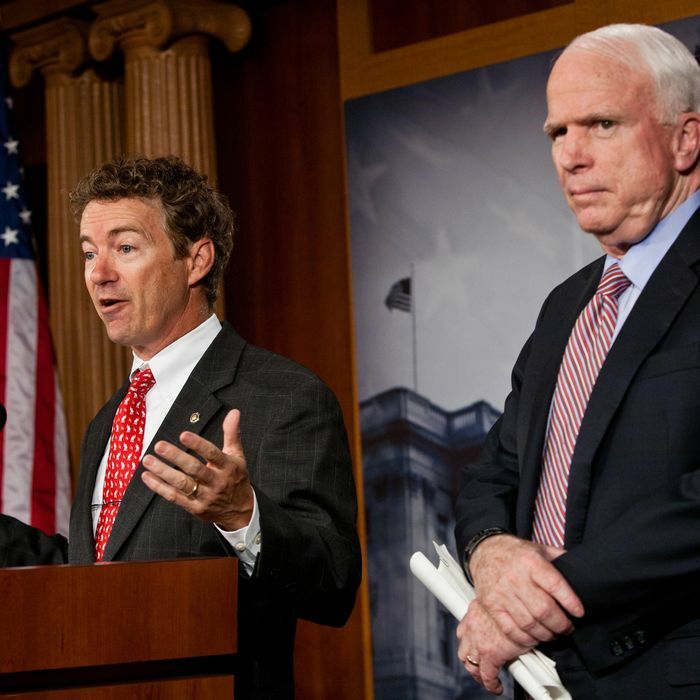 “You know, I think he’s just on the wrong side of history, and on the wrong side of this argument, really,” Paul said later, adding: “I treat Sen. McCain with respect. I don’t think I always get the same in return. Rand Paul is either a liar or too easily captivated by the kinds of outlandish conspiracy theories that excite many of his and his father’s supporters, a cohort long overrepresented by political fringe dwellers. I would give him the benefit of the doubt but I’m not sure which characterization – dissembler or crackpot – would be more generous. Nor are they mutually exclusive. It’s quite possible, likely even, that he is both. Paul opposed an extension of the Patriot Act that would have continued NSA surveillance, putting him in conflict with fellow Republicans. During a Senate debate, Paul tried to cut in as fellow Republican, Indiana senator Dan Coats spoke. Enter McCain.